When selecting pillows for their bedding, Howard Johnson � turned to the most popular manufacturer in the United States, The Pacific Coast Feather Company � and their Down Surround � line of pillows. The Down Surround � pillow can be found in numerous five star hotels and chains because of its pillow in pillow design that makes this pillow ideal for any sleep position and it�s construction is built for long term use and durability. The Down Surround Pillow � inner chamber is what sets this pillow apart from other down & feather pillows. Duck Feather and Duck Down give the Down Surround � a solid but flexible inner core that can support side and back sleepers with ease, but also give comfort to stomach sleepers. The outer chamber is 75% Gray Goose Down which means maximum loft and softness, the classic hallmark of a down & feather pillow. 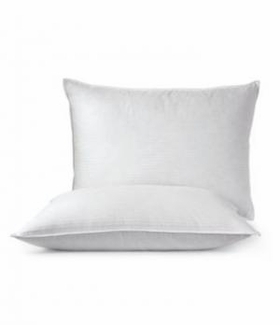 A 230 thread count barrier weave � cover completes this pillow which means that feathers and down stay in the pillow and you will own one of the most durable feather & down pillows available today. See what Howard Johnson � guests are experiencing in your own home with the Pacific Coast � Down Surround Pillow tonight! The Howard Johnson � mark is owned by Wyndham Hotels Inc.; this trademark is not owned or licensed by HotelPillow.com. The Howard Johnson Hotels � mark is used on this website for descriptive purposes to inform customers that the Pacific Coast Down Surround � Pillows sold by HotelPillow.com is the same down pillow found in many Howard Johnson � properties. 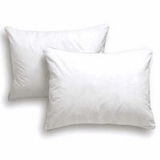 The Pacific Coast Down Surround � Pillow is not manufactured by Wyndham Hotels �.